SatoshiDICE, one of the earliest Bitcoin gambling games, launched early in 2012 on the BitcoinTalk forum. By mid-2013, it had already processed $13 million worth of bets and was responsible for between 25 to 50 percent of all transactions on the network. While people have been gambling online since the mid-'90s, gambling sites have been historically plagued by issues, from government seizures to finding payment processors to misusing user funds as personal piggy banks. In 2011, the FBI raided three of the top gambling sites: PokerStars, Ultimate Bet, and Full Tilt Poker. They found that Full Tilt owed $390 million to players but only had $60 million in the bank. When you gamble with a centralized service, you're trusting them to determine fair odds they're determining the odds in a fair way and to have the money to pay out your winning bets. Historically, this has been the exception rather than the norm. The biggest advantage of cryptocurrency for gambling is it provides a way for gambling sites to process transactions directly to and from their users without having to go through an external payment processor—many of whom refuse to provide service for gambling sites. It also makes gambling sites more difficult to regulate and shut down by the government. 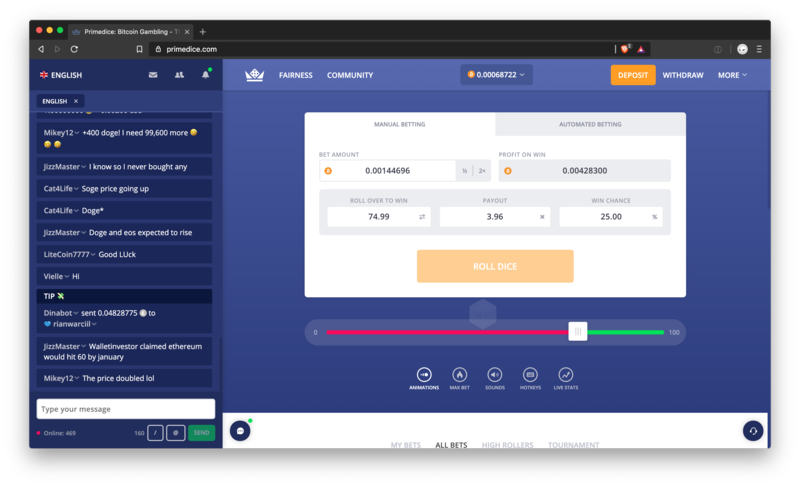 Provably fair: Provably fair games provide players with a way to verify the randomness of their bets typically by providing a client seed, a server seed, and a nonce that the player can use to check the results of their bets. The most popular type of provably fair gambling game is simply rolling dice, but other common forms include baccarat, jackpot, poker, and roulette. Invest in the house: A number of crypto gambling sites give players the option to bankroll the house in exchange for a share of the winnings. On-chain betting: With decentralized applications on computing platforms like Ethereum and EOS, players can stake their bets and settle them directly on the network. 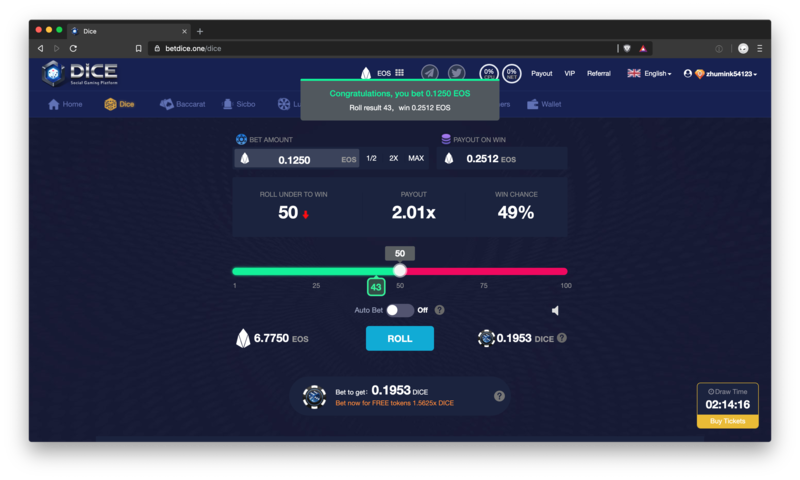 In this guide, we focus on gambling sites that are provably fair, meaning that they offer players a way to validate the randomness of the site—either by providing a client seed or by settling bets directly on chain through smart contracts. EOS is our top pick for best gambling coin because you can bet directly on-chain without having to deposit funds into a gambling site, and transactions are free and settle instantly. EOS also has the most gambling activity out of all coins on our list, with the biggest selection of games. The data above was sourced from DappRadar on 1/11/19. On-chain betting: Instead of depositing Bitcoin to a gambling site's address and trusting that you'll be able to withdraw it fairly in the future, on EOS you send EOS tokens to a smart contract each time you place a bet, you're paid out directly from that contract each bet. That means that you don't have to trust a centralized party to hold onto your money. Play different games from a single account: On EOS, you control your funds through an account, which consists of an active key and an owner key. You can use your account to directly log into different gambling sites and bet with the funds in your account—rather than having to deposit funds on each site you want to play on. Profit-sharing:EOS gambling sites also often offer players the ability to share in profits by staking tokens on the EOS network. The way this typically works is that a gambling site will have a native token. Players can buy this token, or they get it as a reward for gambling. They can then "stake" these tokens, and receive a proportional payout from the site's profits. These advantages have drive gambling activity on EOS past Ethereum and up to par with Bitcoin in less than a year. The top EOS game, Dice, has a transaction volume of $69 million for the week of January 4th. 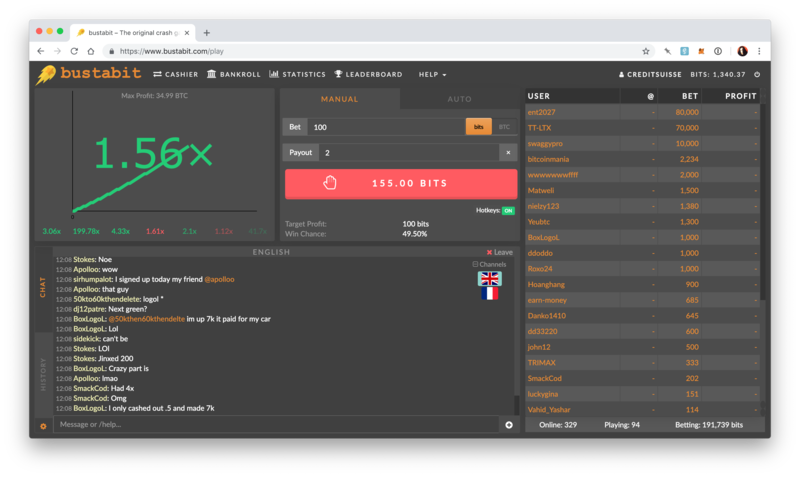 That includes both the bets players wager in EOS, along with payouts from Dice for winning bets—putting the total wagered on Dice in the same ballpark as the $33 million that's been wagered on Bustabit over the same period. Honestly, I don't understand the whole EOS thing. Why people decided out of all the companies in the world that could run a federated permissioned ledger that it should be one run by people with a track record of borderline fraud I will never understand. 21 nodes are responsible for confirming transactions on EOS, and they also have the power to reverse transactions. But while EOS is centralized, you don't really have alternatives to this for gambling. If you're gambling with Bitcoin, you have to deposit your funds into the wallet of a third-party service—so you have to trust a centralized third-party anyways. Players should be aware that EOS is still a new network, with many kinks to work out. Gambling via smart contracts is riskier than through a centralized server—two of the top EOS gambling sites were hacked last fall by exploiting smart contract code. In the wager above, a winning bet for .1250 EOS pays out .2512 EOS. With a transaction volume of 28.6 million EOS for the week of January 4, 2019, Dice is the most popular gambling site on EOS. Beyond dicing, the site also offers the ability to play baccarat, lottery, roulette, and more. When players gamble on Dice, they're betting directly on the chain. 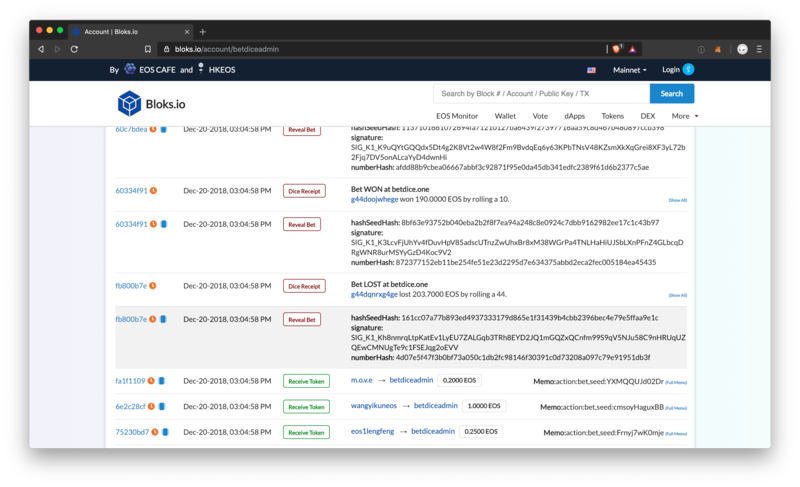 Above, you can see the transaction history for a smart contract from Dice. When players place a bet, the amount of the bet is sent to BetDice's smart contract. When you place a bet on Dice, you're sending money from your EOS account to the Dice smart contract on the EOS network. 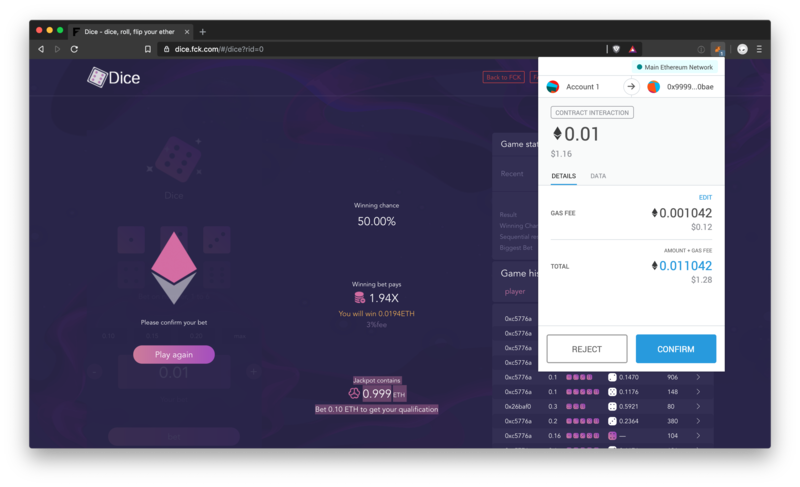 In that transaction, Dice appends the server seed, client seed, and nonce that is used to determine the result of the bet—that players can use to audit the fairness of the game. While the actual games you can play on Dice aren't that different from what you would see on a Bitcoin site, it uses a number of mechanics to make the game more addicting. Drawing under 9000 leads to a .005 EOS payout on Lucky Draw. Players get a free ticket to play the Lucky Draw game once every 24 hours. When you play a ticket, you select a random number between 1 and 10,000 with a chance to win 50 EOS. Each bet on Dice that's over one EOS gives players another ticket that they can use to play Lucky Draw. Staking 15 DICE tokens on Dice. 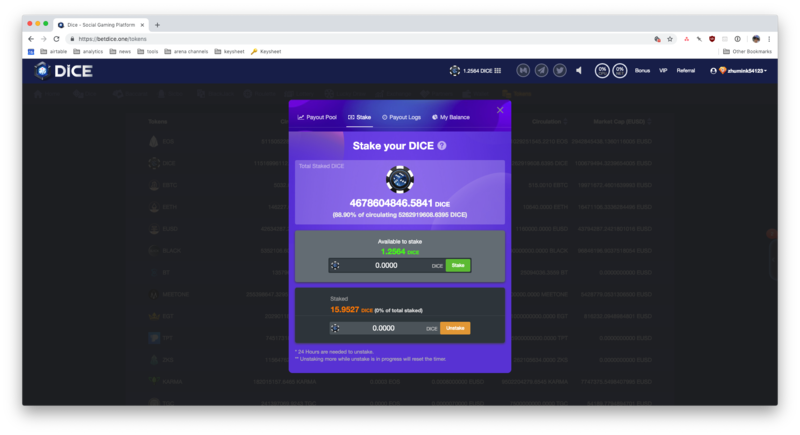 Dice also gives players the ability to participate in profit sharing on the site by staking DICE tokens native to the game. Each bet on Dice gives players a certain number of DICE tokens. They can then stake these tokens to receive a payout from the site's profits proportional to the amount they stake. 50% of profits on Dice are paid out to players with DICE staked. Map of territories on Endless World War. 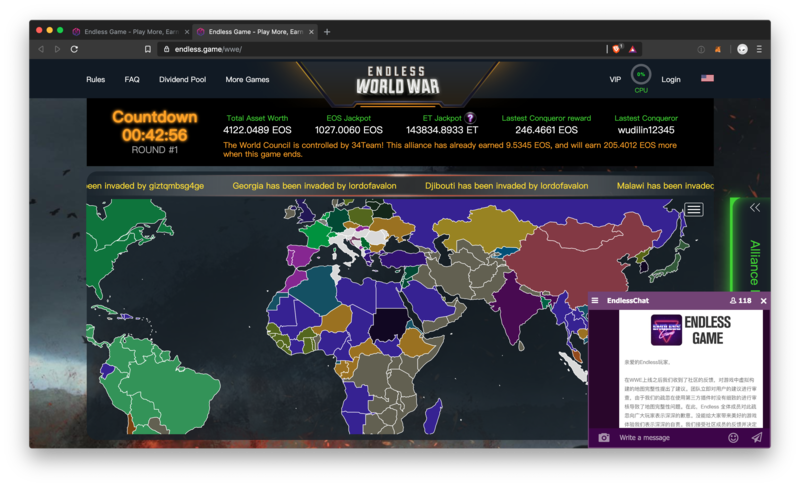 World War Endless is a hybrid strategy and gambling game unique to EOS. Players compete to take over a map of the world—and make money if they win. Each time a player invades a territory on the map, they pay a multiple of the territory's current value. Each game lasts a minimum of three hours. 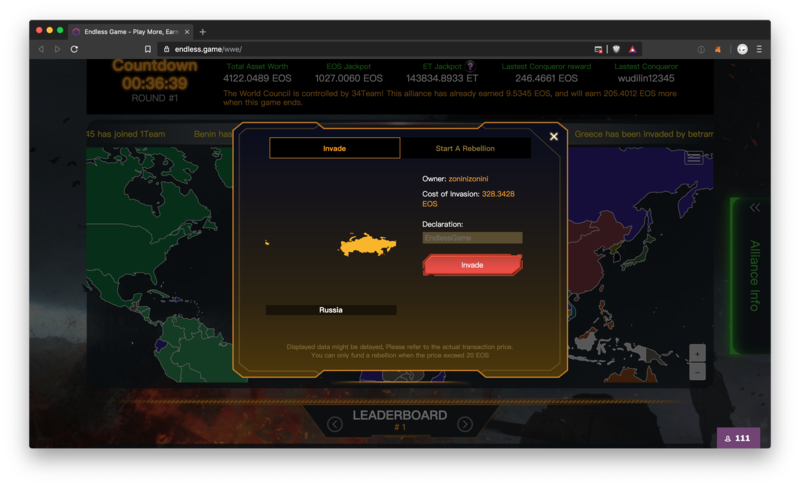 At the start of the game, you can take control of a territory for one EOS. As the game progresses, you can invade territories controlled by other players for a multiplier of the current value. The multiplier is set at a base of 1.4 the current value of the territory. In the game above, the cost of invading Russia is 326 EOS or around $815. This mechanic works to up the stakes of the game as time passes. Each time a country is invaded, 50% of the cost of the invasion goes into the game's jackpot. By late in the game, countries that have been frequently invaded such as Russia or the U.S. can cost hundreds of EOS to take over. In World War Endless, players can form alliances with other players. In a game, the alliance with the highest value of territories combined controls the World Presidency. This gives each player in the alliance a cut of each transaction that occurs in the game, which is distributed in proportion to the value of the territories a player controls. At the end of the game, 20% of the jackpot goes to the winning alliance, and 80% goes to all players who control territories at the end of the game. While we previously ranked Bitcoin as the best coin for gambling it has been eclipsed by gambling activity on EOS. Bitcoin gambling sites still offer the highest payouts of any coin on our list, which makes it great for high rollers. But slow transaction times and high network fees mean that you can't gamble on chain, and you're trusting a centralized operator with your money. The data from the chart above was sourced from DiceSites.com on 1/11/19. 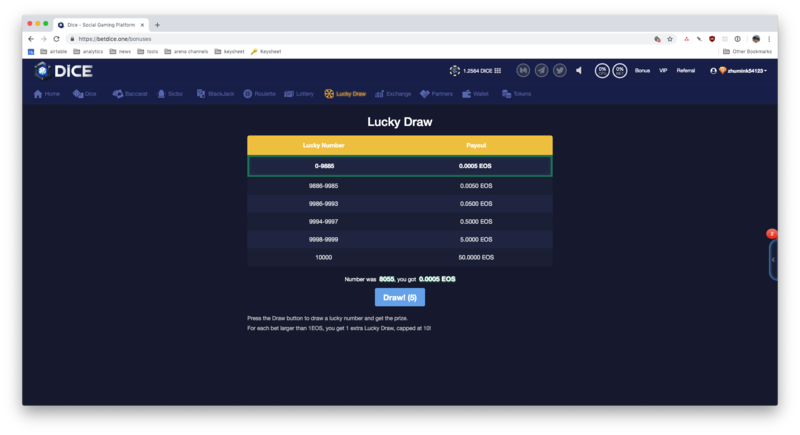 Most provably fair Bitcoin gambling sites look fairly the same—low-resolution graphics and interfaces that haven't paid a lot of attention to design. They typically offer the same types of games as well, with dicing games being the most common as well as slots, roulette, and plinko. Because Bitcoin transactions can take 30 minutes or more to settle, and transaction fees can spike upwards of $10 during times of high network congestion, Bitcoin gambling sites require you to deposit funds into an address that they control to start gambling. That means that you have to trust that they won't run off with it. It also makes it inconvenient to gamble across sites, as you have to wait around 30 minutes for your deposit to be confirmed by each site. Bitcoin has unfortunately innovated more lowly than Yahoo in the last 10 years. It may end up the reserve e-gold, but the conservatism that has prevented evolution of the tech may ultimately even threaten that status. While gambling on Bitcoin requires trusting a centralized third-party service with your money—you can find a lot of gambling games on Bitcoin that are provably fair. For each bet, provably fair websites provide you with a server seed, a client seed, and a nonce, that you can use to check the randomness of your bets. You still have to trust that a site won't run off with your money or get its wallet hacked, but you can at least verify that the gambling part works as advertised. The above bet on Prime Dice for .00145 BTC has a 25% chance of paying out .004283 BTC. Primedice, created in 2013, is one of the oldest Bitcoin gambling sites. Primedice is a simple, no-frills dicing game, one of the most popular formats for crypto gambling games. While Primedice offers few variations on the traditional dicing format, what separates it from the pack is a maximum payout of 30 BTC for a single bet—or around $120,000. To play, you simply type in a bet amount and click a button to roll a number between 1 and 100. You can give yourself higher or lower odds of winning by adjusting a slider at the bottom of the game. The lower the odds, the higher your potential payout on the bet. For example, if you drag the slider a quarter to the right, you have to roll a number between 75 or higher to win, giving you a 25% chance of winning. With lower odds of winning, your payout increases to 3.96 of your bet. A multiplier of 1.56x on Bustabit. Like Primedice, Bustabit is another Bitcoin dicing game that's been running since 2013. It's also one of the most popular games on the network, with 1.4 million BTC—or nearly $6 billion—in total wagered since the site got started. Bustabit offers a maximum profit of 41.1 BTC, or north of $160,000 per bet. Bustabit puts a unique, addictive spin on the traditional dicing format. Instead of setting the odds before you place your bet, on bustabit, gambling takes place in rounds. Before a round starts, players place their wagers. The moment a round begins, a multiplier begins to tick from 1x in the top left of the screen. At a randomly determined point, the round will go “bust.” If a player cashes out before the round goes bust, they receive their initial bet multiplied by the multiplier. If the round goes bust before they cash out, they lose their bets. Bustabit's current total bankroll is 5,305 BTC, or over $2 million. Bustabit also offers players the ability to bankroll the house and earn a share of the winnings. 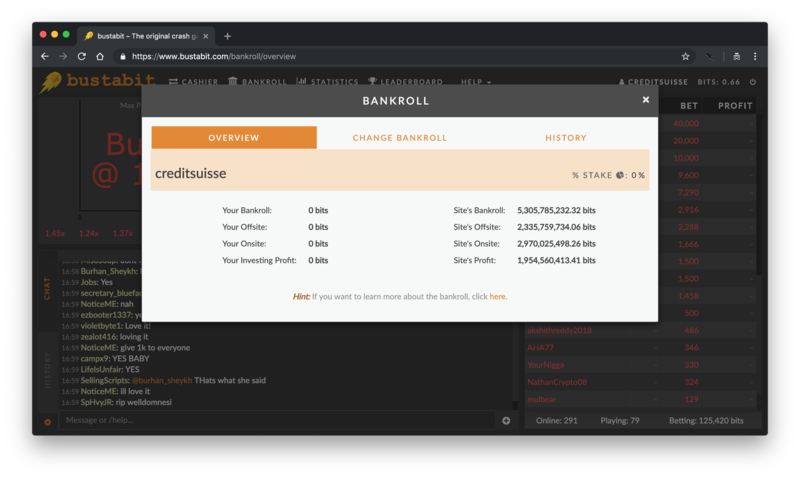 Bustabit's total bankroll is currently at 5,305 BTC or over $21 million. Players receive a share of the site's profits according to the amount they've personally put into the bankroll. If you're a sports fanatic, Nitrogen Sports offers you the ability to bet on everything from your college football team's upcoming match to the winner of the UFC championship belt. While the site's focus is on eSports, it also allows you to make bets on other events, like the Academy Awards. The winning bet above for $.003 BTC on an NFL match paid out .0025 BTC. 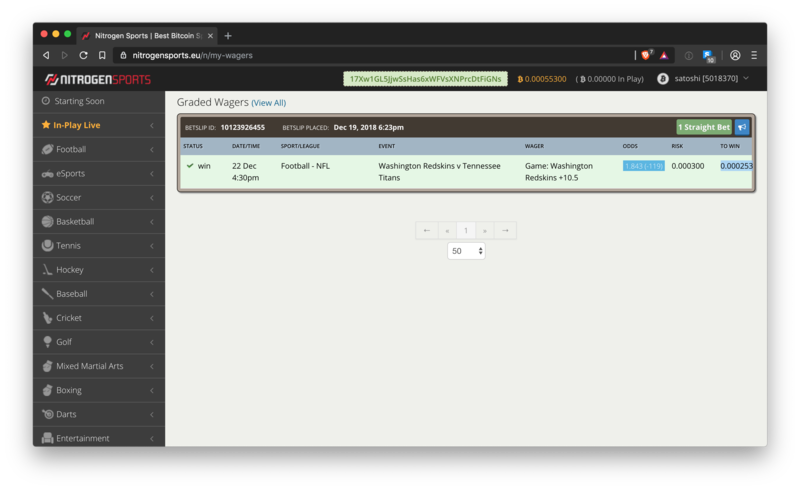 Nitrogen Sports gives players a pretty good book of bets on commonly watched sports, such as college football, the NFL, and soccer matches. It's harder to find bets for less popular sports, such as darts or cricket. We don't recommend Ethereum for gambling. While Ethereum, like EOS, introduced the ability for players to gamble directly on the chain through smart contracts, each bet costs a transaction fee and takes several minutes or more to settle, which completely takes the fun out of gambling. There also simply isn't a lot of gambling activity on Ethereum compared to Bitcoin or EOS. The data above was sourced from State of the Dapps on 1/11/19. Ethereum's native scripting language allows for the creation of smart contracts or snippets of code that can be uploaded to the network and executed autonomously when conditions are met. What's cool about that is that it means that certain gambling sites on Ethereum actually process your wagers directly on the chain—rather than through a centralized provider. You can also look at the smart contract code to see if a gambling site is provably fair. The fun of gambling however, isn't in using smart contracts on a decentralized network. It's in the instant gratification of finding out if you won or lost after placing a bet. Waiting several minutes for your transaction to be confirmed on Ethereum take the fun out of gambling. EOS could surpass ETH in dApp activity. As Serenity delays continue, developer mindshare will wander. EOS smart contracts use C++ and compile into WebAssembly (better dev experience. On-chain governance works in EOS, isn’t close in ETH. Ethereum offers gamblers a inferior experience compared to EOS, which is why a lot of gambling activity has left the platform. FCK is currently the most popular gambling site on Ethereum, with a transaction volume of 13,800 ETH for the week of January 4, 2019. 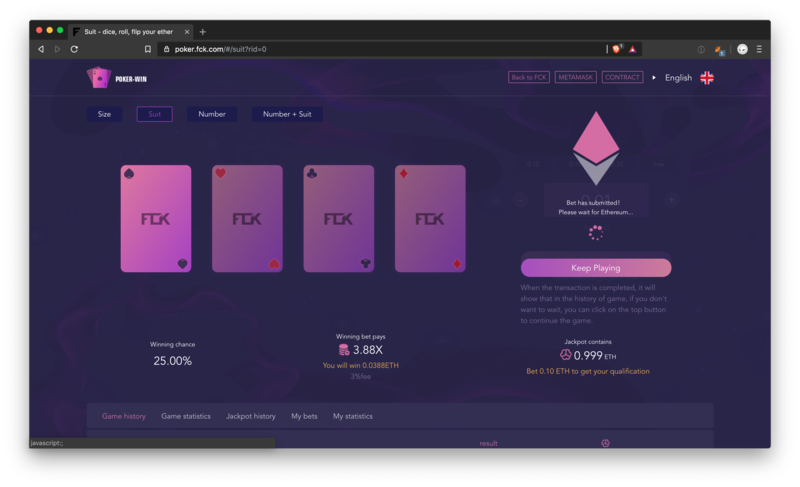 FCK allows players to play a number of games directly on the Ethereum network from dice to poker, roulette, and more. Each bet placed on FCK is settled on chain, which means that you need to confirm the transaction using a wallet like MetaMask and pay a small network fee of around 12¢. Like similar games on EOS, you make bets on FCK directly from your Ethereum wallet using an in-browser wallet like MetaMask. Bets that you place are sent directly to FCK's smart contracts, and payouts are sent directly to your wallet address. But while EOS transactions are settled nearly instantly, transactions on Ethereum take much longer to process—anywhere from between three to 30 minutes. That takes away significantly from the actual experience of gambling. Once you place a wager, you're stuck refreshing the page, waiting several minutes to see if you won or lost. We tested a number of other coins for gambling, including Litecoin and Monero. The problem with these coins is that there simply aren't that many games you can play. While gambling on Litecoin initially took off as a low fee alternative to Bitcoin, most Litecoin specific gambling sites, like LiteDice and Lotitbit have shut down. Monero offers players anonymous transactions, which is useful if you're playing from a country like the US where gambling is illegal. However, there simply aren't enough places you can gamble with Monero. The one Monero-specific gambling site we found, MoneroDice, is currently being closed for maintenance. Several multi-coin games, like Crypto Games accept both Litecoin and Monero. If you value quick transactions and low fees, you can play with Litecoin. 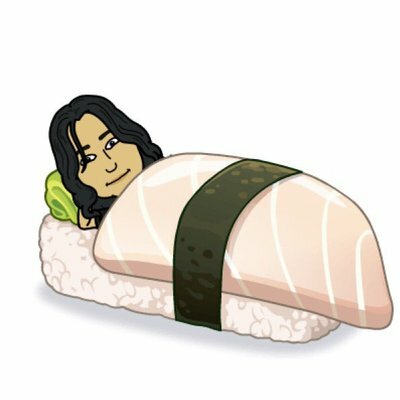 If privacy is important with you, you can choose Monero. But that means that you'll be locked out of the most popular games, like Dice on EOS or Bustabit on Bitcoin.